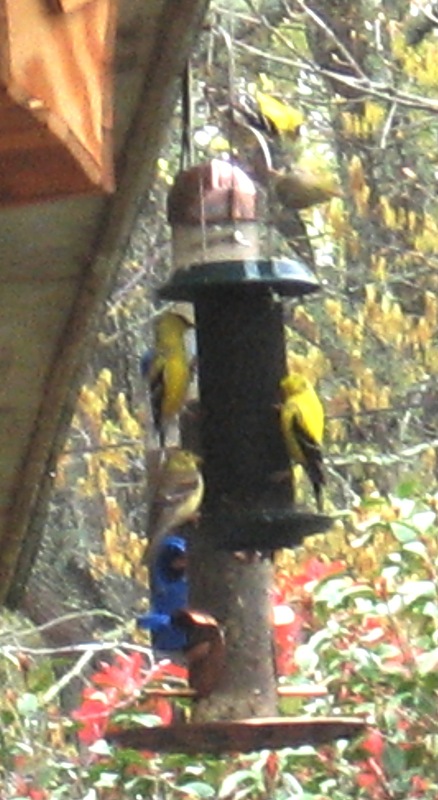 If I were asked to name my favorite bird of all, it would have to be the American Goldfinch. I have many childhood memories of watching these delightful black and yellow birds flitting around on the fence rows in the Indiana countryside. After moving to South Carolina I have enjoyed watching them appear in flocks on a row of small sunflowers I had planted in my yard one fall. Since my last move, I have been less successful with growing sunflowers from seed, but we have still had the privilege of watching them come in flocks to feed on sunflower and thistle seeds at our feeders. I learned that in the winter their plumage becomes a dull yellow and brown, so it took a while for me to recognize them. But by now, they are ready to migrate back north and their feathers are becoming brilliant yellow and black again. What joy to watch them! The bluebirds are another favorite bird for me, though I have had less opportunities to watch them. But this promises to change this year. Last Wednesday my husband and I purchased and set out two bluebird houses in our front yard. We purchased a small booklet about planning for bluebirds, and by the time we got home, we had a plan in place for the best place to set up our birdhouses. When we drove into the back yard and got out of our car, the first thing that caught my eye was not one, but two bluebirds in the treetops between our yard and the next. Joy upon joy! I had been watching for them and thought I had seen a brown female at the feeder recently but couldn’t be sure. We lost no time in getting our birdhouses up realizing that we were already at the tail end of the time bluebirds made their nests. I have been watching one of the birdhouses out my window as I work at my computer hoping to see some action. This Saturday morning – only the third day after setting them up – I watched a flurry of bluebird activity around one of the birdhouses. There are at least two pair of bluebirds checking it out. I am concerned that they may already be fighting over this birdhouse and ignoring the other birdhouse which is not in as suitable of a location. We read that they bluebirds have been known to kill another bluebird that is competing for their nesting site, so tomorrow after church we will be moving the second birdhouse to a more suitable location in our neighbor’s yard. (They have already agreed to this.) I hope we haven’t taken too long to move it, but there was no opportunity to do this today because of prior commitments that kept us out of town. While watching the bluebirds in the front yard and the goldfinches on the feeders in the backyard I made another discovery. Goldfinches love dandelions. We are not lawn fanatics who get bent out of shape over dandelions in the lawn. We like having both dandelions and clover for the honeybees. But while watching the bluebirds fight over the birdhouse, I discovered a flock of goldfinches on the ground around the dandelions. It first appeared that the dandelions were popping like popcorn until I realized that the things that were popping up and down were goldfinches. I hurried to get my camera, but my movements scared them away and they didn’t come back to the dandelions. Walking around the house with camera in hand I found them on the bird feeder, though I couldn’t get close enough for a really good picture. We had to leave for Charleston by noon and didn’t get home ’till after dark. I can’t wait until tomorrow to see them all again. I hope we will get the second birdhouse moved quickly, and then get a few good pictures of both bluebirds and goldfinches.